You’ve seen it on face washes, acne creams, dandruff shampoos as an active ingredient. Yes, I am talking about tea tree oil, a miraculous oil extracted from the leaves of Melaleuca alternifolia with a tonne of benefits that makes it staple in many cosmetics and personal care products. But rather than buying a bottled product, why not reap the beauty benefits of tea tree oil directly by using the concentrated essential oil in home remedies? How would you do it? Well, we tell you here 10 beauty benefits of tea tree oil and how you can use it in your daily regime. Topmost on the benefits of tea tree oil is its ability to fight acne, that it is so famous for. It is a concentrated oil, yes, but can be topically applied on pimples with a cotton bud. Its anti-microbial action helps fight acne causing bacteria. It is also anti-inflammatory and helps in soothing down any redness and irritation caused by acne. Tea tree oil is anti fungal. Applying it on athlete’s foot or fungal nail infections will give you quicker relief. The anti-inflammatory properties of tea tree oil, when combined with those of aloe vera works magic on sun burns. Mix together two tsp of aloe vera gel and two drops of tea tree oil and apply on affected area. You will immediately notice a tingling cooling sensation. It relieves the skin of all redness and irritation. Mix together two drops of tea tree oil in your hair massage oil and massage your hair and scalp really well with it. It helps ward off scalp infections like dandruff and helps keep your scalp clean. Massaging with the oil also helps unclog hair follicles and promotes hair growth. Add a few drops of tea tree essential oil in your bath water. Its spicy fragrance will help you fight body odor and also control excess sweating. Massage the area where you have ingrown hair with some tea tree oil directly. Tea tree oil helps loosen up the ingrown hair. Next, apply a scrub on this area in order to get rid of ingrown hair. Tea tree oil actually helps in regulating the oil produced by the skin. To gain its benefit, massage your skin in the night with two drops of tea tree oil mixed in any carrier oil like grape seed oil or jojoba oil or plain coconut oil. The fragrance of the oil helps you sleep better too! Ok, you can fight acne with tea tree oil, but what about its scars? 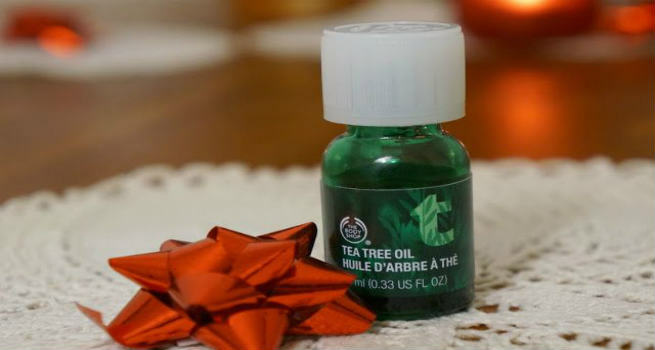 Worry not, cause tea tree oil has the answer for that too! Mix together a drop of tea tree oil with a drop of vitamin E oil and half a tsp of aloe vera gel. Apply this on the face and massage well. Leave it overnight. Do this regularly to get rid of acne scars. Tea tree oil works on the sebum in the skin by cleaning the pores. Hence it makes for a great ingredient in a toner. In fact, you can make a toner by simply mixing one part of tea tree oil in 9 parts of water and apply it on the skin after cleaning it for unclogged pores. Have an unsightly insect bite that you are sure everybody will notice? Apply tea tree oil on it with a bud and let it rest for a while. Within a few hours, the swelling will go down completely.